The Sacramento German Genealogy Society was formed in 1983 and put out its first newsletter in January 1984 (just one page). From that humble beginning the SGGS that we know today slowly emerged. "It all started in 1983 when a handful of Sacramentans got together to discuss their German roots. They began meeting on a regular basis. Before long, they were electing officers. They even proposed the idea of becoming a chapter of the Palatines to America. But that plan, after some study, was not considered the best course to take. So this handful of locals, naming themselves the 'Sacramento German Genealogy Society,' grew. In eight months, the organization claimed 44 members; buy the time it was ten years old, membership hit 388." 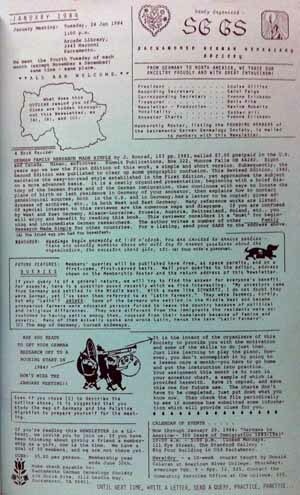 SGGS' very first newsletter (January 1984). Not yet called "Der Blumenbaum." 1983 SGGS is formed and eventually acquires 197 members. The first monthly lecture meeting takes place Sept. 27, 1983. 1984 SGGS begins workshop meetings. Dues is $5 per year. Eighty people attend an annual seminar. SGGS incorporates. 1985 SGGS submits an application for an IRS tax exemption. 140 members. SGGS begins holding annual seminars and/or workshops. The organization's journal is retitled "Der Blumenbaum" beginning with Volume 2, Number 8 (March issue). 1986 A 501(c)(3) tax exemption is received from the IRS. SGGS is now a public charity. Donations to SGGS are now tax deductable. 1987 SGGS meets at the Northminister Presbyterian Church, publishes the monthly Der Blumenbaum, hosts a study group meeting and runs a computerized bulletin board (not a website). 1988 Membership increases to 283. Purchased an overhead projector, portable screen, amp and speakers. Der Blumenbaum print volume reaches the magic number of 300 (the minimum amount for bulk mailing). 1989 Doubled the size of Der Blumenbaum from four pages to eight. SGGS obtains a bulk mail permit. Decision made to print Der Blumenbaum on colored paper and to publish it bi-monthly. At the October meeting, refreshment were served in honor of German unification. The round organization logo is creatd by Paul F.C. Mueller and approved by the membership. It appears for the first time in the Volume 7, Number 7 (Februrary) issue of Der Blumenbaum. 1991 Der Blumenbaum becomes a quarterly and its size is increased to 20 pages. Dues increased to $10. 1992 Membership now stands at 335. Dues increased to $12 (individual) and $18 (family). Collection of pedigree charts begins. Der Blumenbaum now has a color cover with ivory inner pages. Shirley Riemer becomes editor of Der Blumenbaum beginning with the Volume 10, Number 2 (Oct/Nov/Dec) issue. 1993 The Family History Library plans to place the first ten years of Der Blumenbaum onto microfiche. 1994 SGGS obtains a sales tax permit. Membership reaches a record high of 451. Purchased SGGS banner from Tap Plastics for $56. 1995 Dues raised to $15/$20. Membership is over 600. The German Card is now being sold by SGGS. The German handshake packet service begins. SGGS posts a home page on an Internet website. SGGS begins to look for a new meeting location that can accommodate a computer for presentations. Startes the Pfenning Pfund to help increase the German collection at the FHC. Der Blumenbaum takes second place in the EileenPayne Odom Genealogy Library International and Family Tree newsletter competition. 1996 Membership reaches a high of 950. 1997 Der Blumenbaum receives the California State Genealogical Alliance (CSGA) "Publication Award." SGGS purchases a wireless microphone system. Membership continues in the 900 range. 1998 St. Mark's United Methodist Church selected as the new meeting location beginning with the first meeting in 1999. Membership increases to 1,181. The National Genealogica Society (NGS) names Der Blumenbaum as "Runner Up" in its newsletter competition – in the Major Genealogical Societies category. 1999 Membership increases to 1,205. Dues increased to $20/25. Storage cabinet placed at the church. SGGS hires an accountant (self-employed). SGGS participates in a multiple-group effort to staff a booth at the California State Fair. Unfortunatley the project fails due to registration problems. A descriptive catalog (book) of local German resources is created by SGGS volunteers. 2000 Membership increases to 1,211. SGGS creates its own website. 2001 Membership increases to 1,268. First mention in the board minutes that SGGS will participate in Family History Day at the state archives library. 2002 Membership increases to 1,294. SGGS works with the local Family History Center to reorganize its German library shelf. 2003 Preparations begin early for SGGS' big 20-year anniversary celebration in 2004. Membership increases to 1,376. SGGS puts on a two-day German Family History SLAM event consisting of a Gala celebration of SGGS' 20th birthday followed the next day by the usual annual seminar. Dues increased to $30/$35. SGGS staffs a booth at the NGS conference in Sacramento. SGGS replaces its contract accountant with an accounting service. 2005 SGGS discovers that its name is misspelled in state records – Sacramento German Geneological Society. Amended its Articles of Incorporation to correct it. 2006 SGGS conducts is first multiple-track annual seminar. 2007 Descriptive Catalog of German Resources book revised by SGGS volunteers. SGGS volunteers put together a portable exhibit booth (German flag table covers, back drop, supplies, exhibits). 2008 SGGS begins staffing a booth at the local Turn Verein's annual Christkindlmarkt event. 2009 SGGS volunteers update the Der Blumenbaum index book. 2010 SGGS administrative records digitized except for signed minutes. 2011 SGGS begins use of electronic signatures for minutes. Admin records are now 100% digital. SGGS designs and produces red t-shirts with a map of the old German empire on its front. SGGS produces a WorldGenWeb brochure focusing on Germany. 2012 SGGS creates and produces large German Empire maps. SGGS migrates its website and membership database to "The Cloud" by subscribing to EasyNetSites. 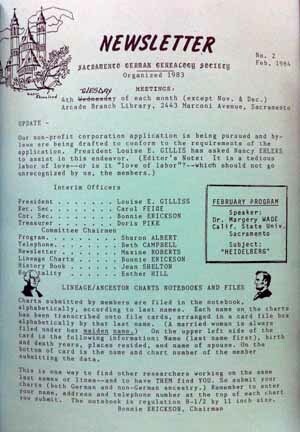 2013 Members-only website section created with a large and growing amount of organizational and genealogical content. Successfully accomplished our most complex annual seminar ever attempted – seven speakers, three lecture tracks plus a fourth track of free individual consultations. Started posting speaker handouts on the website provided permission is obtained. Laminated fold-out Searching for Our German Ancestors guide created and instantly became the mail order merchandise best seller. 2014 The National Genealogical Society (NGS) names Der Blumenbaum as winner in the first-prize category of its Newsletter Competition, with the co-winner in that category being the Silicon Valley Computer Genealogy Group. SGGS completed its transition to the Cloud-based EasyNetSites system. All mailed correspondence and purchases now go to the SGGS P.O. box. Year closes with 880 members. Started regular use of PayPal on the website (seminar registration, membershp purchase and renewal, online store). Later used the Square payment service (set up by Bill Cole) to allow mobile devices to accept credit/debit card payments at meetings and special events (like Christkindlmarkt). 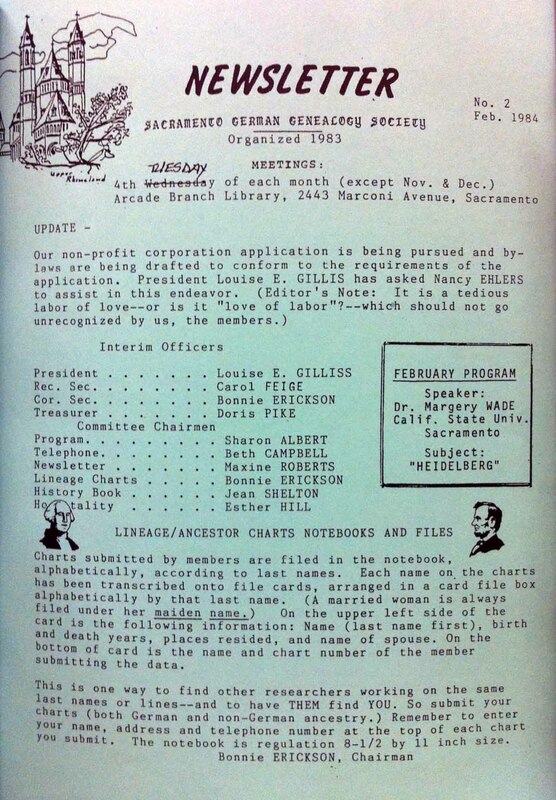 Milt Kelly completed a project to digitalize the paper pedigree charts. Brian Hansen initiated a revising the pedigree chart index project. SGGS began a subscription to the Wufoo online forms service which allowed Rick Hanson to create online forms for seminar registration, membership purchase & renewal, and member surveys. The Der Blumenbaum Planning Committee started looking into obtaining additional Der Blumenbaum editing help. Bill Cole chaired the Strategic Planning Committee which began defining long-term goals and implementing improvements to SGGS' operations and activities. Bill Cole and Ingeborg Carpenter served as liaisons to the new German-American Genealogical Partnership effort with SGGS becoming a founding member in June. Year closes with 861 members. Long-time book sales manager Rex Smith retired due to ill health and later passed away. He'll be missed. Two SGGS volunteers (Bill Cole, Ingeborg Carpenter) began working with IGGP to plan their 2017 conference in Minneapolis. A major revision to the SGGS bylaws was approved at its annual meeting which restructured the Board of Directors to support the next step. That next step took place at the November 15 Strategic Planning Committee meeting where a major restructuring of the SGGS organization was approved. Approval by the full Board of Directors occurred the following month by an emailed vote. The reorganization's primary goals were to provide a complete definition of positions, improved flexibility and a foundation for future expansion.